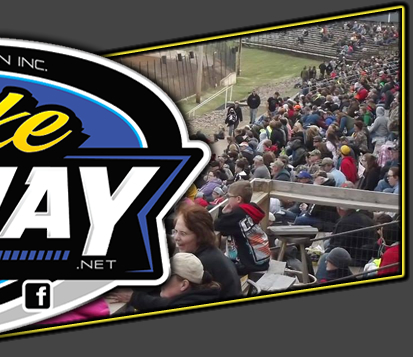 Rice Lake WI, April 16 – Ashley Anderson and Kevin Eder shared the spotlight during the 2016 racing opener Saturday night at the Rice Lake Speedway. Eder won his first ever Super Stock feature at the track and was on his way to a huge double win, only to be edged at the line by less than an a car length as Ashley Anderson nipped him in the Modified feature race. Other winners on the sixty fourth consecutive opening night at the speedway included Curt Myers, Tim Johnson and Jason Havel. 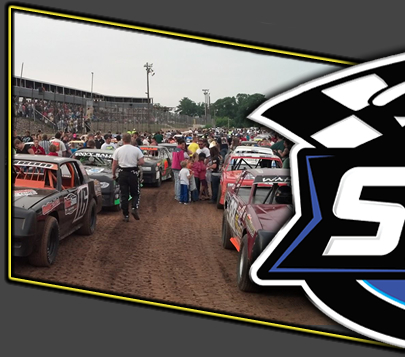 A nice field of ninety two racers from three states signed in to race on opening night in front of a large crowd on what was a Summer like night in northern Wisconsin. Eder led most of the Modified feature after taking the lead from the outside pole at the drop of the green. He was chased for most of the race by Kevin Adams who continually tried to slide under him coming out of each corner, but was never able to make the move stick. Matt Leer was a challenger for quite some time also until he spun in turn one and triggered the second yellow of the race with twelve laps completed. Adams continued to challenge for the lead as Eder still held the top spot but Ashley Anderson and Mike Anderson had both worked their way into contending positions also. Ashley looked to the inside of Adams for second and got beside him on occasion, but each time Adams would fight him off. One final yellow slowed the action with thirteen laps completed and Adams made an all out effort on the green, sliding under Eder as they raced for the lead in turn one. Adams couldn't complete the pass however and as Eder held on to the lead, Adams lost momentum and Ashley Anderson moved into second and dropped under Eder. They raced side by side for the lead for several laps with neither driver able to pull away. The white flag saw them still battling side by side for the lead. In the final corner Eder slid just a bit high and that was Ashley's opportunity to surge ahead, and he pulled out the win by less than a car length. Mike Anderson came on strong at the end as he pulled past the fading Adams for third with Neil Balduc completing the top five. Ashley's win was his first Modified win at Rice Lake since the 2012 racing season. While Eder couldn't pull off the Modified win, he settled for the next best thing as he won his first ever Super Stock feature at Rice Lake, nipping a fellow ABC Speedway regular in Nick Oreskovich by a car length at the line. Ashland regulars dominated the race with Randy Spacek and Oreskovich battling for the lead for the first half of the race with Eder and another ABC regular, Cory Casari, right behind. Oreskovich had used the high side to come from the second row right at the start and pull ahead of Spacek into the lead. However, Randy fought back and they went wheel to wheel for a number of laps with Eder always close behind. Oreskovich continued to hold off Spacek but Eder was closing on both of them as the yellow flew for debris on the track with thirteen laps complete. Eder got a great restart as he was able to pull past Spacek into second and then he maneuvered to the low side and pulled up beside Oreskovich. They ran wheel to wheel as they fought for the top spot with Eder eventually pulling out to a small advantage. Oreskovich maintained the pressure as he went to the high side one last time trying to gain some extra momentum but Eder held him off by a car length for the win. Spacek finished a close third with Curt Myers making a late charge to edge past Scott Lawrence into fourth. Eder's win was accomplished driving the #80 Super Stock owned by Greg Kuklenski. The Midwest Modified feature was a close affair for the first half of the event with five drivers battling hard for the lead. Shane Halopka and Joe Chaplin Jr. fought tooth and nail in the early going for the lead with Ryan Viltz also providing plenty of pressure. Near the midpoint of the race, Myers picked up the pace and he was able to drive around the leaders and take over the top spot and once in front, he stretched his lead as the race stayed under the green for the last eleven laps. Myers continued to pull away from the field as he lengthened his lead over Halopka, who was not able to cut into the Myers advantage. Travis Anderson started to move up at this point after dropping back initially and he got past Viltz to take over the third spot. Austin Ellis also made a nice charge as he got past Chaplin Jr in the late going to crack the top five. 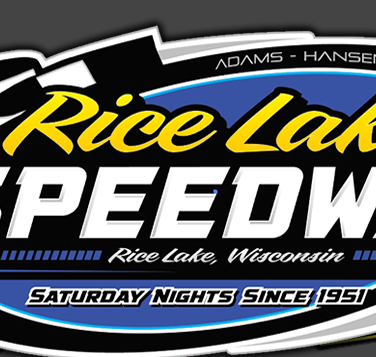 The win for Myers was his first ever at Rice Lake in the Midwest Modifieds, as Myers has focused his efforts at the track in recent years on his Super Stock. Drama prevailed in the Street Stock feature as the leaders got together and a spin resulted, which changed the course of the event. In the early going, Ashley Wahlstrom had one of her best runs at Rice Lake as she raced wheel to wheel with Cooper Berlin for the lead. They traded the lead back and forth with Sam Fankhauser and Kevin Bogdanovic both challenging. Then Cody Kummer picked up the pace as he moved up the track and really started to gain positions. Kummer continued his charge and was able to drive into the lead but also moving was Tim Johnson, who had started in the fourth row. Johnson was pressing the high side too, and he followed Kummer by moving into second. Johnson continued to charge as he got up beside Kummer and edged into the lead. However, as they battled for the top spot, both wanted the same piece of territory in turn one and Johnson got clipped and went for a spin in front of the pack. While everyone was able to miss him, the restart found Johnson restored to his position and Kummer headed for the tail. Johnson then began to pull away following another spin, this one that cost Bogdanovic the second spot. One more yellow set up a two lap sprint to the finish and Johnson pulled away from the pack. Several drivers who had faded back somewhat made late charges with Fankhauser racing back up to second and Scott Clark, Wahlstrom and Kolby Kiehl were all able to get back in the top five. Jason Havel picked up right where he left off in 2015 as the defending track champion raced to the win in the Pure Stock feature. Michael Miller led the opening laps before Havel moved past him and once in front, he opened up a comfortable lead. However, George Richards was not content to led Havel just drive away from the field and using a higher line than most, Richards was able to close the gap, catching Havel with just a couple of laps left. Richards gave it everything he had but Havel maintained his line and Richards had to settle for riding Havel's rear bumper across the finish line. Joel Hinrichs recovered from an early spin to race his way to third at the finish with Austin Workman and Tucker Quinn completing the top five. Another five division program is scheduled for this coming Saturday night, April 23rd. Along with racing in five divisions, the winners of the Best Appearing Car awards are scheduled to be announced also. Warm ups begin at 6:30 p.m.